Have you ever wondered where ideas come from and how stories are made? Would you like to know the true stories behind some of Andy's books and characters? Are you a teacher looking for simple, practical and inspiring writing activities for your next creative writing class? Would you like to discover tons of great ways to have fun with words and pictures? If you answered `Yes' to any of these questions then this is definitely the right book for you! 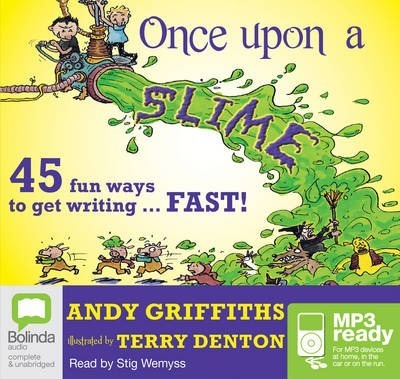 Designed for teachers, students and young aspiring writers, Once Upon a Slime contains a stack of fun writing and storytelling activities. Examples from Andy and Terry's books are used to inspire readers to have as much fun playing with ideas, words and pictures as Andy and Terry do when they get together to create their crazy books.